Styled in an eclectic mix of Scandinavian, Loft and Caribbean beachside, this lovely villa is part of Opio but is just a short walk from the lively village of Valbonne. If you are looking for the perfect place to stay on the Cote d'Azur then Cocoa Flower Villa may be just the answer. Four bedrooms/three bathrooms and can sleep up to 9. Villa Cocoa Flower is an unusual and stylish villa that is in a very quiet environment but is just a short walk from the lively village of Valbonne. The walk into Valbonne is 1.2km and is very pleasant, passing by some lovely villas and olive groves. Just the ticket to visit the market in Valbonne on a Friday. Opio is 2.5km away and offers some very nice shops, including a Lebanese delicatessen. The villa is a mixture of partly newly-renovated and partly newly-built. The villa is 230m². There is a big family room of 100m², which includes kitchen area and living room. The family room has direct access to the dining terrace, the pool terrace, and the bedroom terrace. An original mix of styles, “Scandinavian”, “Art Deco” and “Loft “ make the atmosphere unique and quite 'zen'. The owners are very interested in interior design and a clean, healthy lifestyle so they grow a lot of their own vegetables, some of which may reach your dinner table to be enjoyed surrounded by the fragrance of summer on the Mediterranean. The pool is 4.5m x 8.5 m, and it is a “saltwater” pool. The pool is of course equipped with an alarm. The entrance hall connects the family room and the " night area"/bedrooms. There is a guest toilet in the entrance hall and also a direct access to the dining terrace. 4 bedrooms, 3 bathrooms and one separate toilet. Three of the bedrooms and two bathrooms are in the "night area" These all have air conditioning. The fourth bedroom is in a separate studio, with separate entrance from the garden. One master bedroom of 18M² with private bathroom of 12m². The bathroom has a big wardrobe, toilet, shower and bathtub. There is a direct access from this bedroom to the terraces. There is one bedroom of 22m², also with a big wardrobe. This room can easily sleep 2 or 3 persons; one double bed and one single. Also this bedroom has direct access to the terraces. And a smaller bedroom of 11m², also with a big wardrobe. These two bedrooms are both situated next to their common bathroom with toilet, shower and bidet. There is also a small office, if required. The last bedroom is a separate studio of 25m²: The studio has a separate entrance rom the garden. There is a small kitchen and a bathroom with shower and toilet. The studio is less hot in the summer, and there is no air conditioning but there are fans. The main outdoor area is focussed around the pool and the dining terraces, both terraces made of wood and each terrace is around 70m². 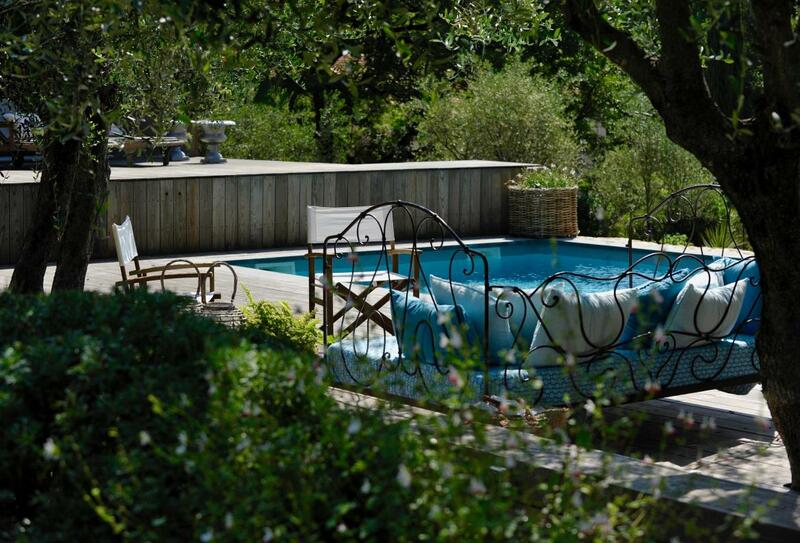 The olive trees included in the pool terrace give a shade when you need to relax out of the sun! On the dining terrace, in front of the family room, a big electrical sun shade takes care of the shade. The garden is 3000m², plenty of space to play and run around. If you arrive in June then you will have to share the garden with hundreds of fireflies every night! Beautiful company! The entrance of the property has easily parking space for up to 10 cars. Four bedrooms, three bathrooms and one separate guest toilet. Three of the bedrooms are in the sleeping area. The fourth bedroom is located in a separate studio, with its own entrance from the garden. Bedroom terrace - 2 Double beds: one 140x 200 and one 160x200. Small Bedroom - 1 Double bed of 140 x 200, Bedroom 11M² with spacious wardrobe. Studio - 1 Sofa bed/Futon , Separate studio with small kitchen and bathroom. Master bedroom - 1 Double Bed of 160 x 200. The master bedroom is 18m2 with en suite bathroom of 12m2. Bathroom 1- Toilet , Shower Enclosure , Bidet. Bathroom for the two other bedrooms in the night area. Bathroom 2 - Toilet , Bath (no shower) , Shower Enclosure , Master bathroom en suite. Bathroom 3 for Studio - Toilet , Shower Enclosure , Small bathroom in the studio, with shower and toilet. Separate WC - Access to guest toilet from the entrance hall. All bedrooms are newly built or renovated. All windows and French doors have shutters. The bathroom has a spacious wardrobe, a toilet, a walk-in shower and a bathtub. You have direct access from this bedroom to the terraces and pool area. The 'terrace' bedroom of 22m² is also equipped with a spacious wardrobe and two doors to the terrace. This room can easily sleep two or four people with two double beds. This bedroom also has direct access to the terraces and pool area. The last bedroom of 11m² also features a large wardrobe. All bedrooms have the same finishes and style. The villa is part of Opio but is actually closer to Valbonne where you have the Friday market, which is just awesome, from 8am - 1pm. In addition to the market on Fridays, there are several very nice restaurants, ice cream shops, bars and lovely shops for clothing and very select home-decoration items etc. The summer evenings in Valbonne are very lively and it is very nice to spend the evening eating on the square or in the small road in the village. There are no cars allowed inside the village. You can also walk to Opio village/ shopping area. The distance is 2.5 km and you would do best to take the car. Opio village does not have cafes etc. but does have a very nice food shopping selection: butcher, bio food, Carrefour supermarket, Lebanese delcatessen, bookshop, opticians, hairdresser and dry cleaning. Just 1km from the house, on the road towards Opio, there is a big play park with fitness gears, basketball and a running track. 500m from the house on the road towards Opio you have a very good bakery, a sushi restaurant, pizzaria and hairdresser. Just beyond the house, you can take a walk into a little forest where, if you keep on going (10minutes) you arrive at Club Med Opio. Linen, bath towels and pool towels provided. Private studio with fourth bedroom not available out of summer season. Minimum 5 night stay out of season. Mid-stay clean included for 2-week bookings. No stiletto heels on the wooden floors, please. All bedrooms have air conditioning except the Studio. The pool is 4.5m x 8.5 m, and is saltwater. The pool is equipped with an alarm. The entrance of the property has easy parking spaces for up to 10 cars. room area to the bedroom area (3 steps up). As there are wooden floors and terraces in and outside of the house, stiletto heels cannot be used to walk on them as they will cause damage. There are a few older towels which can be used as pool towels as long as guests wash them and leave them to dry on departure. From the dining terrace to the pool terrace there are also 3 steps (down). You will be met on arrival by the housekeeper. Arrival time is from 4pm and departure by 11am. Please note: The house has oak, non-treated wooden floors inside and outside so shoes with stiletto heels are not allowed. We are a family of three; Scandinavian/French. We love interior design, decoration and we are very much into an ecological and healthy lifestyle. Our house and our delicious kitchen garden, that may supply you with your tomatoes and salads during your stay, are inspired by this. Simplicity, respect and quality are very important for us. It has a lovely vibe, comfortable lay out and beautiful setting. Almost perfect. The owner was a pleasure to deal with. I would rebook it without hesitation.